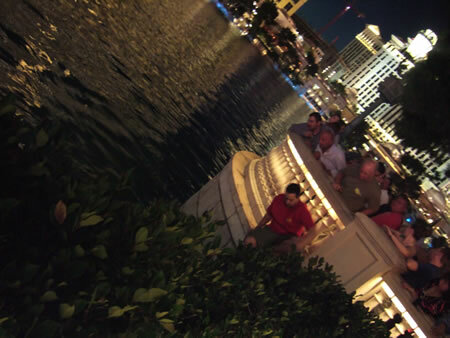 A man has been rescued from the lake at The Bellagio after climbing a tree to get a better look of the fountains and falling in. Unfortunately, rather than just falling directly into the lake, the branch he was on that gave way was above the concrete wall, which he hit as he fell. When it became clear he wasn’t surfacing, several passers by dove in to rescue him. Minutes later the police arrived and helped drag him to safety, though it was clear from his screams that he was in some pain. Bizarrely, I just happened to be there at the scene when it all took place. These pics and vids are from my trusty camera, which annoyingly ran out of memory towards the end. The whole thing was very surreal, particularly when the fountains suddenly burst into life. It was a beautiful night, gloriously warm, and the fountain display was particularly dramatic, but it was a discordant backdrop to the drama unfolding directly beneath me, especially when the man started screaming. Oddly, the crowd around me cheered as the fountains came to their stunning climax, with the rescue effort still in full swing. 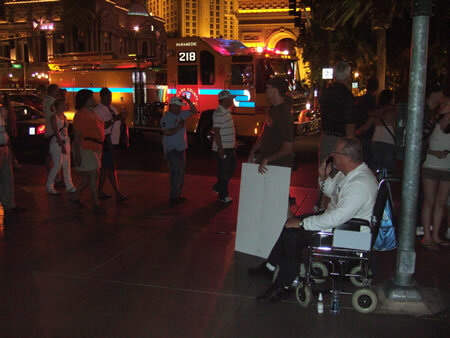 As the man was stretchered off into a waiting ambulance, an old man in a wheelchair on the side of the street suddenly launched into a full-on religious sermon, telling us all to repent our sins or else. He never quite said “or else the fountains of Hell will strike you down, too”, but he might as well have! It’s my first day in Vegas, and if this is a sign of things to come, it’s going to be a pretty eventful week! Hats off to the guys who jumped in and rescued in him, though. They undoubtedly saved his life, as he was knocked out cold by the fall, and was laying there unconscious on the bottom of the lake. You can see the videos of the rescue after the jump. At the risk of digressing from the main story, I’m not actually a Christian, but thanks for the update anyway Daniel. And good on you for helping him out. I was one of the other guys who jumped in to save him (the young irish one).it was within my 1st hour in vegas and certainly did kick off a ridiculously eventful week. Having said that, my friend brian and I were part of the crowd egging him on to jump which we felt terrible about in hindsight. however it was all his idea and he didnt actually fall out of the tree as you thought mike. He told us before he climbed up that he was going to dive in for fun and actually asked me and brian (visible in the first video part behind the cop in the blue shirt with an armful of my clothes) to buy him a beer after. Maybe next time we’re in vegas! It was just rotten luck that the lake was so shallow at that part and he split his head and went unconscious. I remember thinking that he was a stuntman trying to get some publicity with fake blood etc. as he was floating on the bottom of the lake for the first 5/10 seconds. But then when he didnt come back up it got scary we started jumping in. Good work to daniel for being the first in, i think that really spurred me and the other guy into action too before he drowned. Does anybody know if ‘owen’ is okay. I remember him screaming in pain and telling us to let him go as we were trying to hold him up out of the water and i thought maybe he’d hurt his head or neck as well as the huge gash on his head. Also i wonder if he got arrested or in trouble because he told me and my friend before he went in that it was illegal and he had a getaway bike waiting against the rail. On another note, i reckon its for the best that the second video part is dark and unclear as i’m climbing out. i remember wearing a pretty tight pair of white boxers that night which had probably turned transparent due to that pesky wet water they keep at the bellagio. i reckon 2 shows in one night was enough for the tourists!! I’ll leave the religious digression to you guys, im just glad we were all there to help. i did a follow up on this gentleman. He had 6in laceration to scalp, 2 Cervical Vertebrae fractures, Multiple rib fractures. He will make a full recovery because his injuries did not involve any spinal injuries. or read the HOLY BIBLE and if you have any questions feel free to contact me at DanielPalmquist@Gmail.com Always GLORY TO GOD in the name of HIS CHRIST JESUS of Nazareth!